What would a four-year-old most like to do for fun on a beautiful Saturday afternoon? You guessed it: wash windows. No, the boy is not the reincarnation of my grandmother. He really couldn’t care less if our windows were coated with gook. This sudden desire to clean up is not about windows or good housekeeping at all. It’s about toys. The boy has noticed that there are lots of shiny new toys in that wonderland warehouse known as TOYS R US. Except for some of the toys in the aisles that virtually glow with pinkness, he wants them all. At the rate his parents buy him toys, he has calculated that it will take him months, or even years, to collect them all. This is unacceptable. It has been explained to him that the lack of all the money in the world is the principle reason why he cannot have every toy. To combat this problem, he is determined to collect all the money in the world himself. Mommy and Daddy have proven willing to give him some money for doing extra chores, but there may be some flaw in his imagining that all the money in the world can flow to him through Mommy and Daddy. 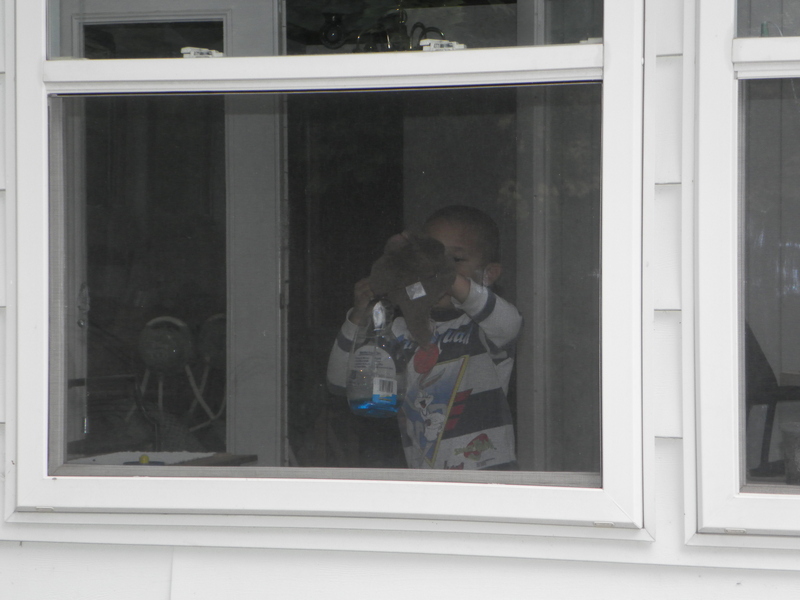 If you hire a four-year-old to clean your windows, make sure you have plenty of Windex, because the spraying is a lot more interesting than the wiping. Our three-seasons room has lots of windows, and though I was in no hurry to clean them, it seemed a good opportunity to reinforce his work ethic. This could be done just as well with a bottle of Windex and some rags as by schlepping around a bucket of dirty water. We went to work at once. 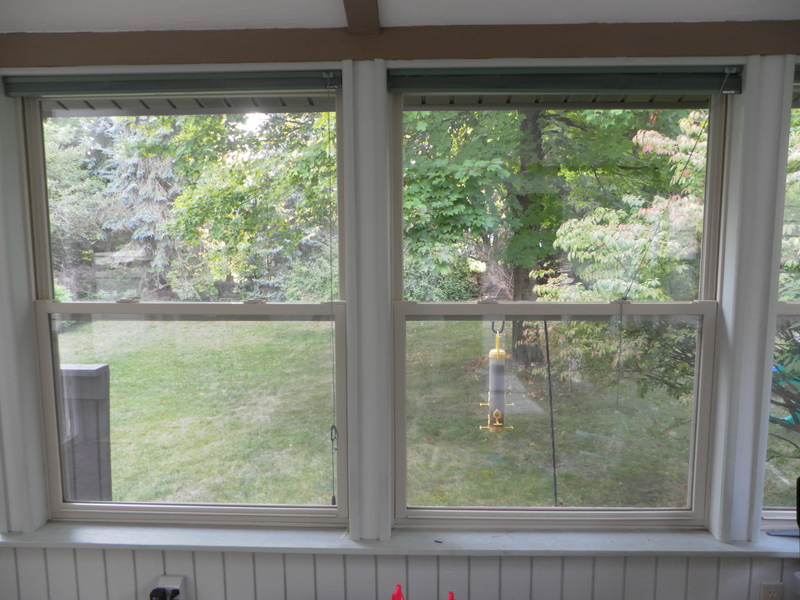 He was able to reach only the lower part of the windows, leaving me responsible for the rest, for which my only reward would be cleaner windows. The boy kept himself motivated for a while, but his interest waned by the time we got to the outside. “You’ve got to finish the job if you want to get any money,” I warned him. “So I can get a paycheck?” he asked. This was an out-of-the-blue head-spinner. Then I realized that the reference was from one of the inappropriate cartoons we like to watch together. As I recall from the cartoon, a mentoring program entails a slacker employee carrying his mentor, in a harness resembling a Baby Bjorn, while the mentor barks commands at him. I don’t want to be in a mentoring program either. The boy stuck with it until the job was done, perhaps motivated by the image of a nagging father strapped to him. I gave him two dollars to put into his wallet and two quarters for his piggy bank. “Can I have two of the dollars with Mr. Lincoln’s picture on them?” he asked. “These have Mr. Washington’s picture. He was a very good man too,” I explained. Next time he wants to earn some money, I’ll have him do my taxes. Thanks to a boy with an ambition, we have learned that there is a back yard beyond our windows. Who would have guessed there was anything so useful beyond all the dirt and grime? This entry was posted in It's a Guy Thing and tagged children, family, fatherhood, humor, mentoring program, parenting, paycheck, Toys R Us, work ethic. Gads, what a smart boy you are raising. I begin to fear that you are right.